that are blocked by MagicSpam, but for some reason, we don't seem to be getting there. So I have situations where Amazon AWS mail servers, Contant Contentact, MyEmma, etc..etc.. are trying to send emails to our customers, and they are being blocked as spam. that happening, but even in those cases, as it's "amazon" i haven't seen a case yet of truly unwanted email coming from amazon or other "trust worthy mass and email services"
as to not have to individually search and clear legitimate inbound amazon e-mail? And then do the same with all the other "trustworth bulk senders" and "email service providers"
Why isn't magicspam storing emails and allow them to be released yet? Isn't MagicSpam maintaining lists for things like Amazon, Constant Contact, MyEmma, etc..etc, as to generally ALLOW those senders as they are largely responsible in bulk mail? which knocks off the large majority of spam right at the edge. to the inbox, instead of rejecting them outright. should include a configurable string, for example "*****SPAM*****". Reputation" rule by setting the "Status" to the middle position "FLAG". With this new feature, good email should never again be accidentally blocked. most of these appear on a specific BMS list used by MagicSpam called "MIPSpace-Poor" (List Number: 41). marketing companies, sometimes referred to as "Grey Area Spam". using a specific BMS list or not. OK, I finally figured out that Amazon SES, MailChimp, Constant Contact, aweber, etc. etc. were all being blocked when they shouldn't be. You say that this is in list MIPSace-poor. But I have that list turned OFF. Yet they are being blocked, with that list in the message. Your website cuts off the right side of the image. Open the image in another tab and you'll see the settings are there on the right. You'll notice that MIPSpace-poor, #41, is OFF. We understand that some of the users are still blocking the traffic on a reputation list #41, even though this list is turned off on the global level. 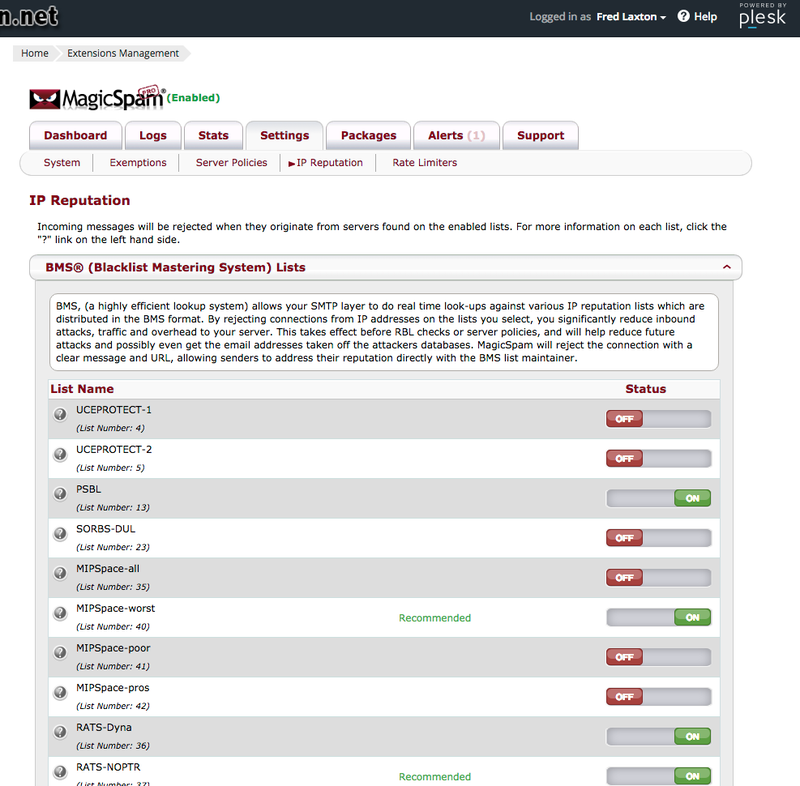 From the screenshot you sent us we can see that you are using MagicSpam Pro and the MIPSpace-poor, #41 is turned OFF. With MagicSpam Pro when you disable the IP reputation list on the global level, users still have the opportunity to enable this list on the user level. In order to fix this issue, make sure that the user does not have this list enabled on the user level. Thank you for supporting MagicSpam.